In Buchanan Capital Markets, LLC v. DeLuca, a decision that was handed down on November 15, 2016, one of New York's appellate courts weighed in on whether firing an employee without cause inherently vitiates their non-compete. Spoiler Alert: According to this Court, it does. (2) seeking an order compelling the defendants to return the clients' proprietary and confidential information that defendants allegedly took with them. According to Buchanan, these former employees were barred from doing so on account of the non-compete agreements they had signed with plaintiff's predecessor in interest. The New York County trial court saw things differently, and denied plaintiff's application for the injunction. Buchanan appealed. 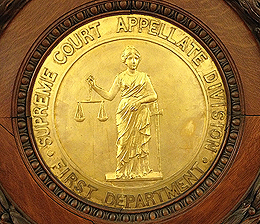 In affirming the trial court's order, the Appellate Division, First Department (which handles appeals from the Manhattan and Bronx trial courts) issued a relatively short, but truly significant opinion. First, they noted that since the clients had not signed any contract whereby they agreed to remain with Buchanan (or its predecessor in interest) for a specified amount of time, "[T]he clients should be free to pick the firm they want, be it plaintiff or defendants' new firm." "Plaintiff essentially complains that it has lost customers to defendants' new firm. However, “[l]ost profits . . . are clearly compensable with money damages” (Sterling Fifth Assoc. v Carpentille Corp., 5 AD3d 328, 329 [1st Dept 2004]; see Derfner Mgt. Inc. v Lenhill Realty Corp., 105 AD3d 683 [1st Dept 2013]). "Plaintiff sought an injunction enforcing covenants not to compete in employment agreements between its predecessor and defendants. Thus, to show a likelihood of success on the merits, plaintiff had to show that the restrictive covenants were enforceable. However, such covenants are not enforceable if the employer (plaintiff) does not demonstrate “continued willingness to employ the party covenanting not to compete” (Post v Merrill Lynch, Pierce, Fenner & Smith, 48 NY2d 84, 89 ), i.e., defendants." This holding stands in stark contrast to some of the opinions coming out of the some other courts in New York - particularly those of the Second Circuit Federal Court - that insisted the Court of Appeals' (the highest court in New York State) opinion in Post should not be read or applied as inherently barring the enforcement of a non-compete against a former employee that was discharged without cause. For additional information on this topic, see Hyde v. KLS Professional Advisors Group, and my article on the subject that was pubished in the New York Law Journal, a copy of which can be accessed here. As you would certainly guess from the NYLJ article, I wholeheartedly agree with the outcome of this decision. 2 Comments to "NY Appeals Court: Firing Without Cause Vitiates Non-Compete"
Thanks for taking the time to post a thoughtful comment, William. To be sure, your point about a pyrrhic victory for an employer, who can get an uncollectible money judgment against a disloyal (former) employee is well-taken. I do think, however, that you have taken the Court's holding, and my view of it, a bit too far. Your argument that "the Court is saying, that you agree with, is that a con-compete is virtually never enforceable," is inaccurate; I merely agreed with the premise that where an employee is terminated without cause, basic contract principles mandate that it would be unfair to hold only one side (in this case, the employee) to the agreement without a corresponding obligation on the part of the former employer. So what the Court is saying, that you agree with, is that a con-compete is virtually never enforceable. Under this interpretation what is the incentive for a business to hire management level employees. It seems that the holding, treats the theft of confidential information as if it is a non-compete restriction. If that is indeed the case, the lines between the covenants would be blurred. How would money compensate the plaintiff if the defendant's don't have the resources. An injunction is also to prevent continuing harm, which the court summarily dismisses, as well as, maintain the status quo until the matter can be completely adjudicated. It seems unfair that the employees in this case misappropriated property that was an essential part of the company's good will, that took years and substantial funds to develop (I am assuming that is was cultivated over many years and that it was not in the public domain)? It doesn't reward innovation but cultivates illegal acts. Why spend years and substantial funds, when you can steal? It is an extreme interpretation and makes the balance as the imbalance it was designed to prevent. Post a Comment to "NY Appeals Court: Firing Without Cause Vitiates Non-Compete"